Smoking tobacco contributes to up to 90% of all lung cancer deaths and is known to cause chronic obstructive pulmonary disease (COPD) such as emphysema and bronchitis. Even nonsmokers who are regularly exposed to secondhand smoke have a 20–30% higher risk of developing lung cancer. However, quitting smoking and/or staying away from secondhand smoke will greatly reduce your chances of developing lung cancer/disease. If you are a smoker, quit smoking. 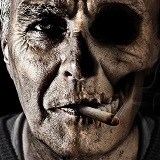 If you are not a smoker, do not pick up the habit, and stay away from secondhand smoke. Eat plenty of cruciferous vegetables and turmeric when quitting smoking. Cruciferous vegetables such as broccoli and cauliflower contain detoxifying enzymes that will help your cells reverse the damage the carcinogens in tobacco smoke have done to your DNA. Turmeric contains curcumin, which has also been proven to be a natural anti-cancer agent. Be wary of fumes from frying fat—keep your kitchen well ventilated to avoid lung cancer. Fat that is being fried will release toxic chemicals with mutagenic properties into the air. This is especially true when frying animal fat. If inhaled, these chemicals can cause lung cancer. Keep your kitchen well ventilated to minimize your inhalation of these fumes!